Marriage Certificate Translation Information: As a legal document confirming the marriage between two individuals a marriage certificate (sometimes referred to in foreign jurisdictions as a marriage license, wedding certificate, wedding license, certificate of matrimony, etc.) may be required for immigration applications. In the US, individuals applying for a Green Card (i.e. a permanent resident visa), Citizenship and Immigration Services (USCIS, formerly Immigration and Naturalization Service – INS) requires the submission of certified translation of your marriage certificate. Marriage certificates may also be required when opening a joint bank account with a spouse and in life insurance claims. In divorce proceedings, a marriage certificate issued in a foreign language (i.e. other than English) will have to be submitted to the courts with jurisdiction along with an official (certified) translation. Moreover, the translation may need to be notarized (or accompanied by a sworn affidavit by a translator with the appropriate credentials). Fast and Reliable – We can source the freelance marriage certificate translation resource you need! If you’ve recently moved to the United States or Canada, or if the official language of your native country isn't the same as the country you've moved to, there is every likelihood that you've run into situations where you've been asked to have your personal documents translated. 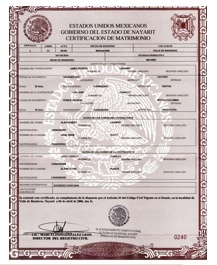 A marriage certificate is an essential piece of status confirmation, and is often required in commercial transactions (banking, insurance,etc.) as well as receive government assistance and apply for residency permits. In addition to providing marriage certificate document translation services from any language into the English, French or Spanish languages, we can also assist you with the translation of English language material into the world's most popular languages: English to Chinese; English to Arabic; English to German; English to Japanese; English to Portuguese; English to Russian; English to Korean; English to Italian; English to Hindi; to name but the most popular among the more than 75 languages that we can handle for you.